I love to Believe that synchronicity and coincidences are a sign that you're on the right track. I'd heard about the ASTAR (Awakening Spirit Through Art) art classes through a friend but at the time was not in a position to do a course. Six months later, in December a friend of my sister came to buy one of my Origami Nightingale Mobiles which she wanted to give as a gift to her Art Teacher. 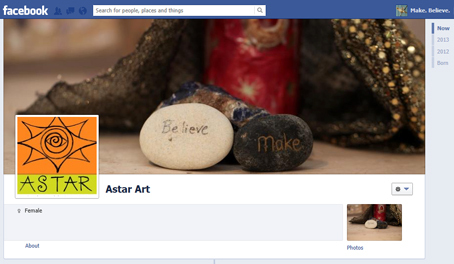 It turned out that she is doing ASTAR Art classes. This term a space became available in her class and she asked if I'd be interested to join. I had just been paid for a large order of Bird Strings that I'd made before Christmas, so I eagerly paid my deposit to secure my place. one with the word "Believe" and the other with the word "Make"
I just had to smile. This was the affirmation that I'd needed. A message from the Universe, don't you think?